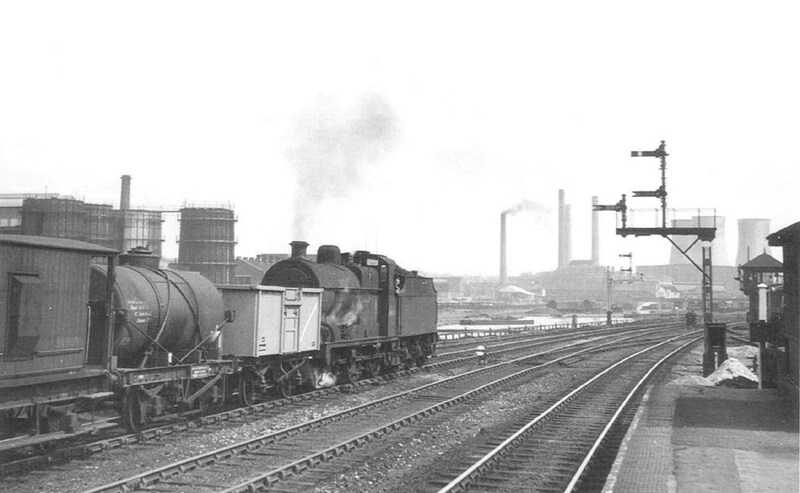 Ex-LMS 0-6-0 4F No 44138 runs tender first past Saltley station on an up working to Washwood Heath sidings on 20th June 1954. Notes by a contributor, Harry, to DJ Norton's website state, 'In the distance are the cooling towers of Nechells power station. The building in front of the towers is the turbine hall. The main boiler house with its two chimneys is to the left of this building, the taller and narrower chimney in front of these is part of the old Nechells A station. The fourth chimney with its cloud of black smoke is no part of the station but is on the other side of the Salford bridge canal junction and is part of the GEC works. Most of the coal for the power station came by canal in those days but there was a link to the railway that was used if the canal froze over.' The 4F had been built at Crewe works in October 1925 and was to remain in service until July 1962 when it was withdrawn from 17A Derby shed for scrapping.